You don’t have to do things the way they’ve always been done. And startups are one of the best places to imagine new futures. It’s okay to break things, to rebuild things, and to do things differently than the way that they’ve always been done. 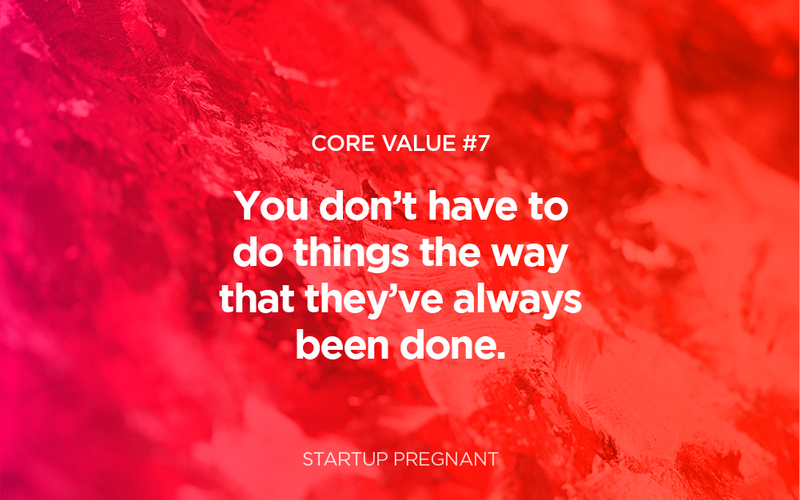 Startups and Pregnancy have a lot in common because they are both creators of new things—ideas, businesses, structures, life—and to do so, they harness a huge range of power. They require both creation and destruction. Sometimes, things fall apart. Things break. And things are destroyed. Part of the nature of creation, of making new things, is that through the act of birth, you are creating both life and death. While the pop culture phenomenon in Silicon Valley likes to glamorize disruption, making it sound glib and peaceful (“We’re going to be the Uber for burritos and disrupt the food industry,”), true destruction can wreak havoc. We’ve seen it in the onset of digital publishing, the contraction of the magazine industry, upending the cab industry, and there’s more coming in the future. These each have far-reaching creative and destructive aspects to them. And on the pregnancy side, inviting a new human into your life is inviting chaos into your world. You start with yourself, or your family unit, or the way your partnership looks, and then you add an entirely new human into it, and it’s not just the child that’s born, it’s the mother, the father, the parents, the grandparents, the siblings — everything changes. Inviting a child into your life is disruptive. The potential here is the idea that you don’t have to do things the way that they’ve always been done. As a mother … you don’t have to do things the way they’ve been done before. As a business owner … you can invent new ways of doing business. As a startup … your entire goal is to not do things the way they’ve been done before. As a person, … you don’t have to work within the framework that you’ve been working. We have the power to do things differently than they’ve been done before. You don’t have to do things the way they’ve always been done before. From November 13th — November 30th, 2017, we’re having a contest on www.startuppregnant.com/thanksgiving-contest! Head to our website to read the rules and prizes, be sure to listen in and leave a comment on every episode released during these two weeks. Head to the show notes listed above to be a part of the contest by leaving a comment. Ends November 30th, 2017.